When I accepted your invitation to speak, I selected as my topic Gandhi’s 7 Deadly Social Sins. Don’t worry – we’re going to get there. Not just yet. First, I want to talk a little about Gandhi. Today is the anniversary, January 30th, of the day that Gandhi was assassinated in 1948, 57 years ago. Starting today across the nation many of us are celebrating the Season of Nonviolence, which begins with the anniversary of Gandhi’s assassination and ends 64 days later, on April 4th, with the anniversary of The Rev. Dr. Martin Luther King’s assassination 25 years later. I have some brochures that I will leave with you that list the events we have planned in San Antonio for the Season for Nonviolence. The highlight is a March, next Saturday morning, that will be lead by Arun Gandhi, the Mahatma’s grandson. We are calling our march a SALT march, and I’d like to explain that. 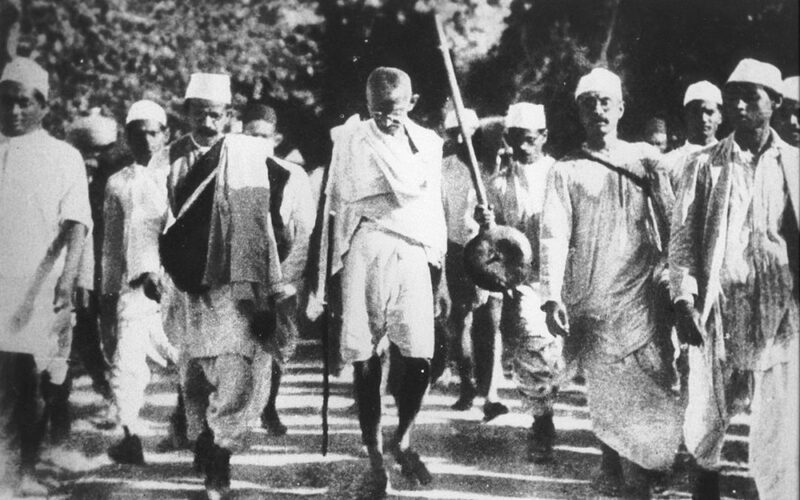 This year is the 75th anniversary of the Salt March in India, an event that Gandhi called the Salt Satyagraha. Satyagraha is a word that doesn’t translate well into English. Literally, it means truth-force or soul-force, perhaps the equivalent of the Quaker’s saying, “Speak truth to Power.” Satyagraha involves an action that exposes an injustice in such a way that the perpetrator of the injustice is so appalled at his own behavior that he changes his ways. It’s like applying heat to a boil to bring it to a head: a satyagraha bring out all of the ugliness to the surface where it cannot survive the light. In English, we generally translate satyagraha as nonviolence, or nonviolent action, or nonviolent resistance. But let’s go back to the salt march, 75 years ago. In January, 1930 India declared independence from India, but nothing really changed. The British were still there, India was still a colony. Gandhi realized that he needed to shake things up if India were to be truly free. He thought about Salt. Since 1827 the British had imposed a tax on salt. Now, salt is necessary to human survival, even more so in a hot climate like India’s. Everyone uses salt: the richest rajah, the poorest untouchable. Indians had been making their own salt for 9,000 years. Even a child could make his or her own salt. All you do is take sea water, boil it, and the residue is salt. But the British forbid the Indians to make their own salt and severely punished those who defied them. Here’s the scoop. The British made lots of salt in Cheshire, but the Indians could make it way cheaper. To protect an important British industry, they forbid Indians to make their own salt and took over the salt works. The Indian salt that was produced was heavily taxed so that it would be more expensive than the Cheshire salt. I could talk for an hour about the history of salt in India, but I would put most of you to sleep. Suffice it to say that the British crushed the Indian salt industry and caused great economic hardship to hundreds of thousands of Indians solely to protect their own economic interests. This is what empires do: they exploit their colonies. It is politics without principle. Wealth without work. Commerce without morality. Gandhi saw this as an injustice that touched every single Indian, rich and poor, in every area of the country in a very basic way. Every Indian could relate to it. He thought, what if we all made salt? What could the British do? They can’t put all of us in jail! Trying to be open about his idea, he wrote to the British governor and asked him to repeal the tax on Salt. The governor never replied. So, on March 12th, Gandhi set out with 74 men from his ashram to walk to the sea, 241 miles away, to make salt. Along the way, others joined him. By the time they reached the sea at Dandi, there were thousands walking with him. At the sea he bent over, picked up a handful of the crusty salt that naturally formed on the coastline there and held it aloft. He made salt! Over the next few weeks, at least 60,000 Indians were arrested for making salt. Gandhi himself was arrested on May 4th. They kept him in jail until January. When he was released, the British invited Gandhi to the negotiating table, the first time they had agreed to talk to an Indian as an equal. This was the real start of Indian independence: thousands upon thousands of Indians refusing to be taken advantage of. I want you to remember that story, because we will come back to it in our discussion of sin. I want you to remember the cultural and historical context in which Gandhi developed his theory of social sin. But we’re not up to that part yet. Soon! Many of you are probably familiar with the classic list of the seven deadly sins: Wrath, Avarice, Sloth, Pride, Lust, Envy, and Gluttony. The 7 deadlies are a particularly Catholic invention, and people are always impressed that this Protestant can rattle them off. Now you know how. You won’t find this list anywhere in the Bible, although all of them are mentioned somewhere in the Christian Testament. At least since the Greeks, philosophers have busied themselves compiling lists of virtues and vices. Christians started – right off the bat! – compiling similar lists. The list we know today is the one formalized by Pope Gregory in the 6th Century, except in the 17th Century the church replaced the S-sin, which until then they called sadness, with Sloth. Sin is an old-fashioned concept. But what these seven deadly sins are, in the final analysis, are character traits and actions that separate us from God. The medievals considered pride the central sin, because all of the others stemmed from it. We are so wrapped up in ourselves and our own selfishness that we don’t have room for anything else. There is no room for God. Pope Gregory said they were sins because they offended against love. The 7 deadlies are, in this context, sins of excess, sins of degree. I’m not sure if I agree. Maybe we need to combine this approach with Pope Gregory’s, that the sins are sinful when they offend against love. Wrath, or anger, when tempered with love, is perhaps similar to Gandhi’s definition of Satyagraha. In fact, Gandhi spoke about exactly this aspect. Anger, he said, is like electricity. When unchecked, as in a bolt of lightening, it can burn down your house. When properly controlled, it can light a city. In the end, though, these are personal sins, regarding my relationship with God, not my relationship with you or your relationship with me. And this, I think, is why Gandhi came up with his seven deadly social sins. Yes! We have finally got to the point of this little talk. What Gandhi was getting at here, I think, was our sins against each other, either as individuals or as institutions. The key word here is SOCIAL. These are crimes against humanity. Not the sins that separate us from God, but the sins that separate us from our fellow humans. Gandhi, like all of us, wrote from his own experience. I related a sprinkling of his experiences in the salt march. The British engaged in politics without principle, or, to put it another way, they ruled without any justice or consideration for the people they governed. Their wealth came without work: it came from exploitation, through measures such as the salt tax. Their commerce was without morality. I don’t think I need to analyze these social sins one by one. Maybe we can save that for our discussion. I’d like to hear what you think about them – not in terms of India in the 1930s but in terms of America in 2005. Maybe you would like to add to the list: Arun Gandhi adds an 8th sin, rights without responsibility. I have been disturbed (this is where I get a little political) in that much of our current political discourse seems to be about the traditional seven deadly sins. Things like – well, lust. They are the sins that separate us from God, and they are worthy of discourse, but perhaps they are not the purpose of government. I am less concerned, for example, with the so-called problem of so-called gay marriage than I am with at least one aspect of science without humanity: that we have the most advanced medical system in the world, yet there are 8.3 million children in this country without any health care coverage. We have the science. We have lost the humanity. And I also reserve the right to be a little theological, where, I admit, I am probably getting in over my head. Organized religion, especially Christian religions, are tending to concentrate on personal salvation at the expense of how we relate in the beloved community. Cathy Clay-Little, another Express-News columnist told me the other day that she sees the African-American churches veering away from a gospel of liberation to one of personal prosperity. That’s one indicator. I’m giving a workshop on peace at a conference being held in San Antonio by one of the mainline protestant denominations. The organizer told me, “Well of course you’ll be explaining how peace is really a matter of finding inner peace.” No, I told her, I will be explaining how peace is a matter of not dropping bombs on other people. When we define sin only as personal shortcomings and fail to define sins as our crimes against our fellow humans, we are in great danger of thinking we can do anything to anybody as long as we think God is on our side. Yes, sin sounds old-fashioned but maybe it’s because we’re stuck in the 6th century. Perhaps its time to focus on social sins. I don’t want to leave you with the impression that Gandhi was totally a here-and-now kinda guy. He was intensely concerned with the spiritual side of life. He ended every day with a prayer meeting, often attended by thousands. So I, too, would like to end with a prayer: Gandhi’s prayer for Peace.